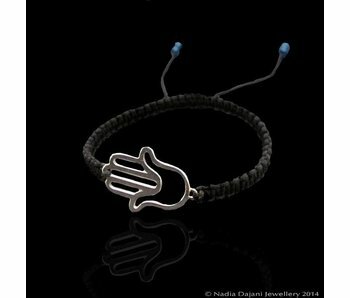 Our own stylised Hand of Fatima motif in silver, in a bracelet and with braided black cord. 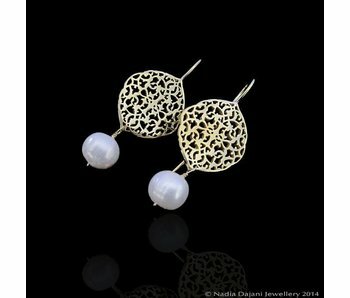 Arabesque earrings in a near oval shape, with an intricate pattern within, and a freshwater pearl drop. 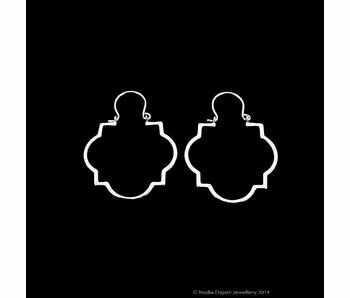 A hook is attached to the motif. 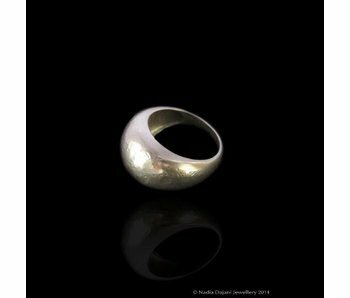 Silver band ring with a hammered finish, typical of the Roman period, many of which are found at the Citadel Museum in Amman, Jordan. 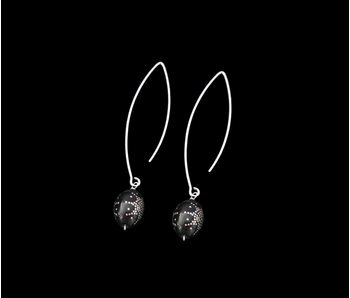 Long oval hoop silver earrings with the traditonal Arabian black coral inlaid with silver 'yousor' bead drops. 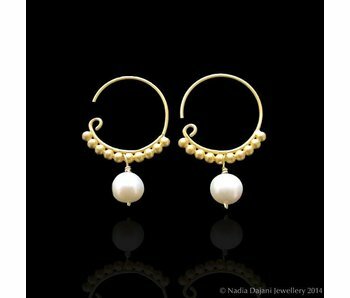 Large oval hoop earrings with a large baroque pearl drop. 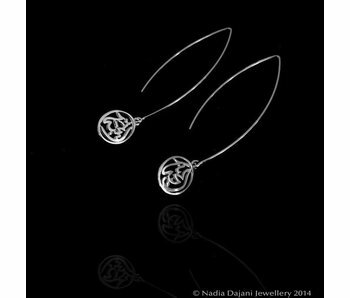 Two tone earrings, with long silver hoops with the words Happiness and Love inscribed in Arabic calligraphy. 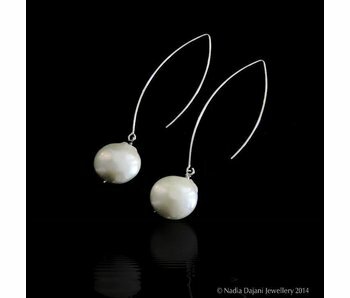 Earring length is 5.5 cm. 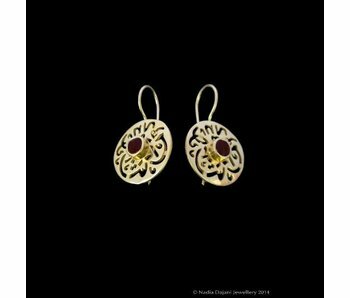 Round silver and gold plated earrings, with a central garnet cabochon gemstone, and the word Masha'Allah inscribed in Arabic calligraphy. 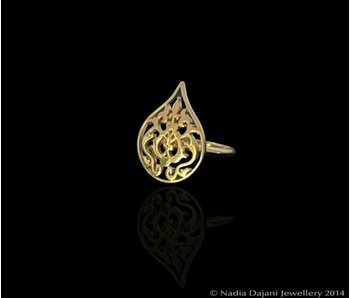 Masha'Allah is said for good intentions and for protection. 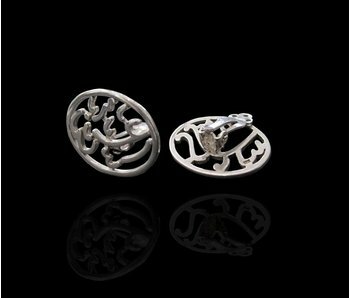 Silver is gold plated with 3 microns. 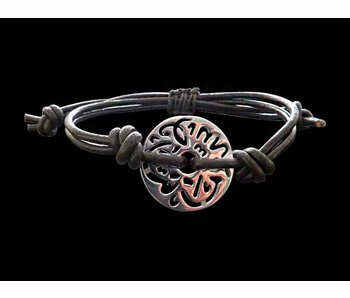 Two row black leather bracelet with our signature silver disc and the phrase Masha'Allah inscribed in Arabic calligraphy. 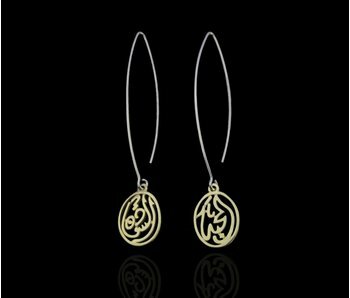 From our Salam collection, long hoop silver earrings with the word 'Love' inscribed in Arabic calligraphy. 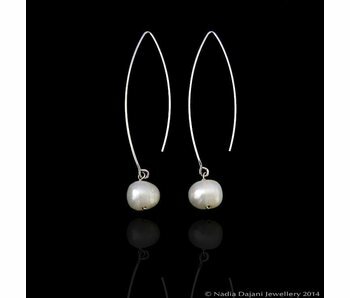 Long hoop silver earrings with large pearl bead drop. 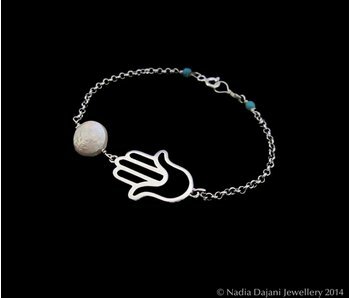 Bracelet with aHand of Fatima motif with silver chain, and a freshwater button pearl. 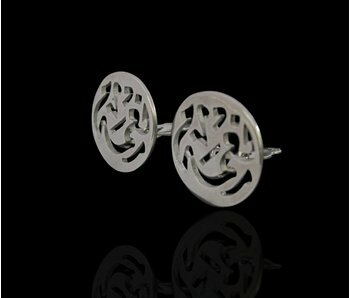 Silver round clip on earrings with the word Nimah, well being, inscribed in Arabic calligraphy. 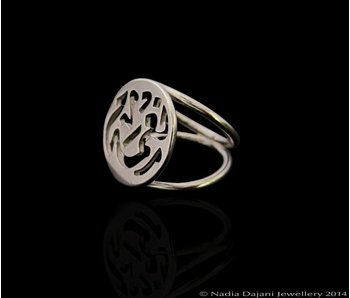 Silver ring with a double band and the word wellbeing, inscribed in Arabic calligraphy. 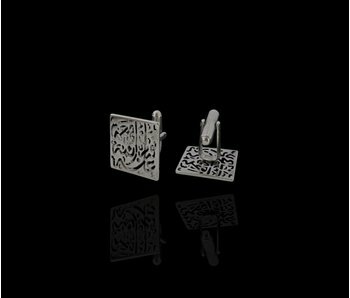 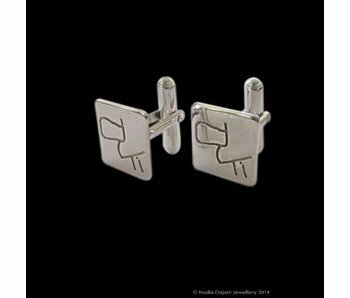 Silver square cufflinks inscribed in Arabic calligraphy with the words Good health and good fortune always. 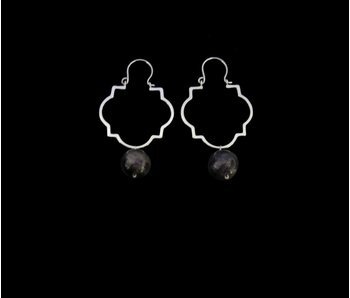 Silver hoop earrings with a geometric profile. 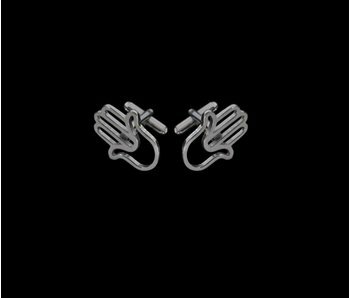 Hand of Fatima cufflinks : this age old symbol for protection is traditional and very popular. 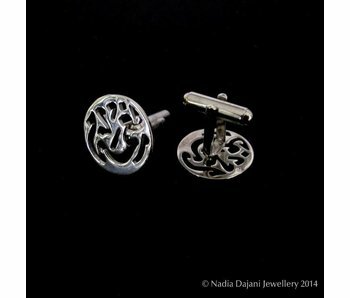 Round silver cufflinks with the word Nimah, wellbeing, inscribed in Arabic calligraphy. 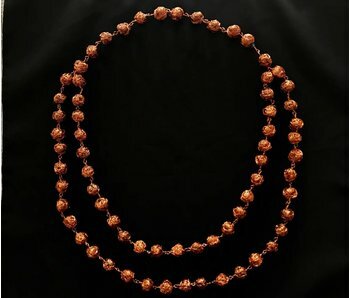 Two row copper bead necklace. 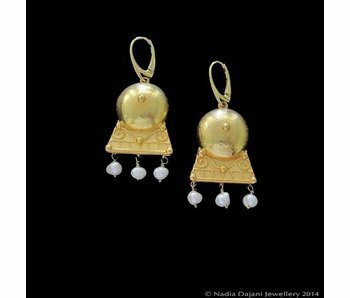 Beads are made from fine copper wires hand rolled into a bead, all linked together with copper wire.